Lighter, DD-561: Marksman brand full size lighter. Well worn finish with dents. Don't know if it works. U.S.S. Prichett. Lighter, LST-1167: Penguin brand lighter. Full size. Don't know if it works. Well worn finish with small dents. U.S.S. Westchester County engraved on the back. Lighter, Goose Air Base: TEECO, Japan brand. 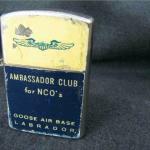 From the Ambassador NCO Club. Shows moderate use. Match Box Cover: STERLING. Maker dates 1909-1940. Empty match box from Sweden with it. Size is 1 3/4" x 1 1/8" x 5/8". Uncleaned. 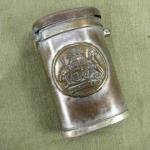 Match Case: Made to look like a Civil War knapsack. Pressed tin construction. Match strike plate on the bottom. Australian made Match Safe: Neat old match safe with the Australian Seal on it. Probably a purchase by a WW2 GI while stationed in Australia. It is non-magnetic so it is probably copper or brass. The original hinge had broken and it was repaired by soldering it back together. Push to open function works and it stays shut when it is supposed to. Size is 2" tall and 1 1/4" wide. 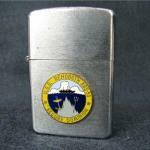 Lighter, AGS-50: Vulcan brand lighter. Full size. Don't know if it works. Hinge is loose. Well worn finish with dents on top.and edges. U.S.S. Rehoboth. 1942-45 ZIPPO MFG. CO. BRADFORD.PA. ZIPPO, PAT. 2032695 & MADE IN U.S.A. is on the round extended bottom. About 1/2 of the original black crinkle finish remains. It has a 3 barrel hinge. 14 hole wind screen. Inside body is also marked ZIPPO etc. Lid still has nice snap when closed. 1956 Dog tags: Thomas, Rance. Two tags with one long chain. CHALLENGE COIN, 8th ARMY, KOREA: 1 5/8" in Diameter. Korea. 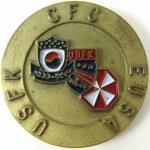 CHALLENGE 8th ARMY PAPERWEIGHT, KOREA: Large 2 1/2" in diameter and heavy. Probably used as a paperweight. 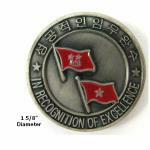 CHALLENGE COIN, 8th ARMY, KOREA: 1 5/8" Diameter. Marked HOOAH! 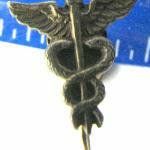 EAR RING, MEDICAL CORPS: Probably worn by Army Nurse or Doctor. Unmarked. Works OK. Only one, not a pair. Unusual item. 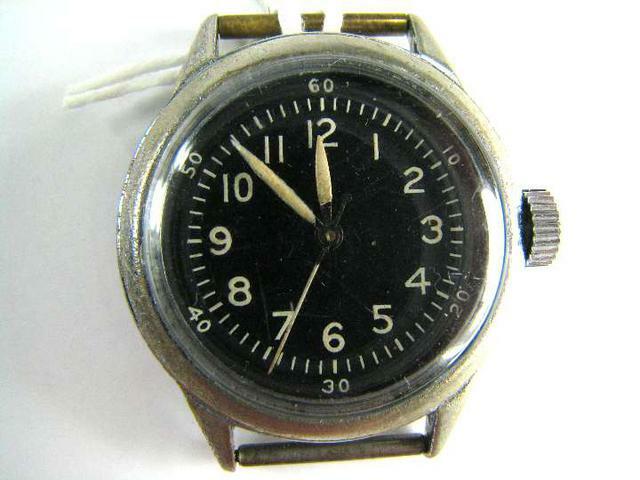 This BULOVA military wristwatch is marked on the back: ORD. 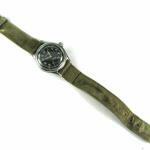 DEPT., U.S.A., OF 98538, BULOVA WATCH COMPANY. The "OF" means it is 15 to 17 Jewel, waterproof case. 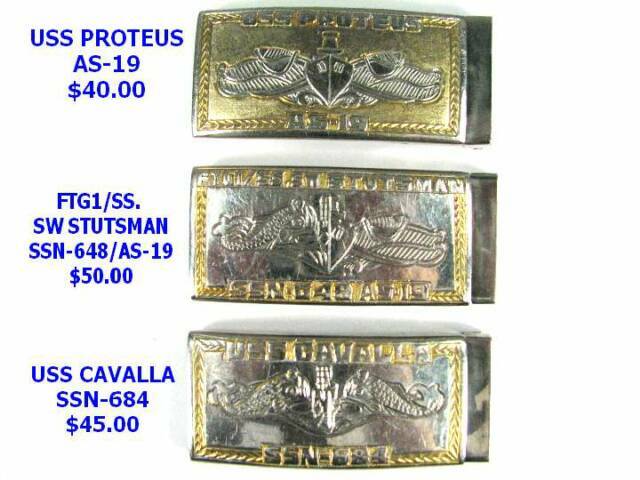 The band has a STERLING buckle that came from the estate of a WW2 US Marine. I don't recall where I got the watch but I paid over $100 just to have it repaired,cleaned, oiled and a new crystal. When it was returned to me, in the mail, one of the hands was laying inside the crystal; it had came off of the arbor or spindle. I took it to a local watch man and he said the arbor was rusted and the hand would not stay on. So another $50 got a new arbor and new hands. However, the hands are not the correct style for the original look. So with what I paid for the watch, the band, the repairs etc. I have a lot in it. 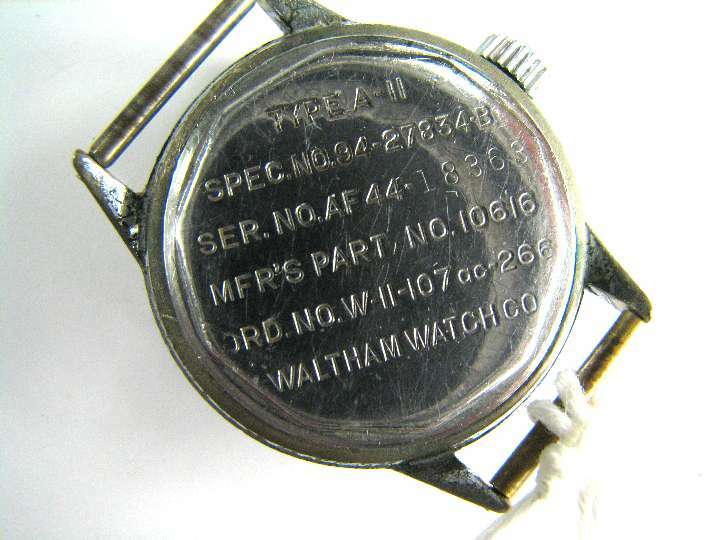 WW2 WALTHAM A-11 Military Watch: This watch has the "hack" feature which allows the watch to be easily synchronized with another watch. The hack works by pulling out the stem and the second hand stops running. When the stem is pushed back in the watch resumes running. This watch was repaired, cleaned and oiled and worn occasionally for a year. Then it quit winding. The stem rotates freely etc. but it either does not engage the mainspring or the mainspring is broken; it will not wind up and run. By the serial number it was made in 1944. 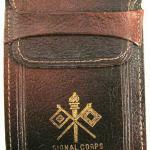 WW2 SIGNAL CORPS WALLET: Appears to be unused. Made of Genuine Leather. Maker mark of XL inside of a diamond. 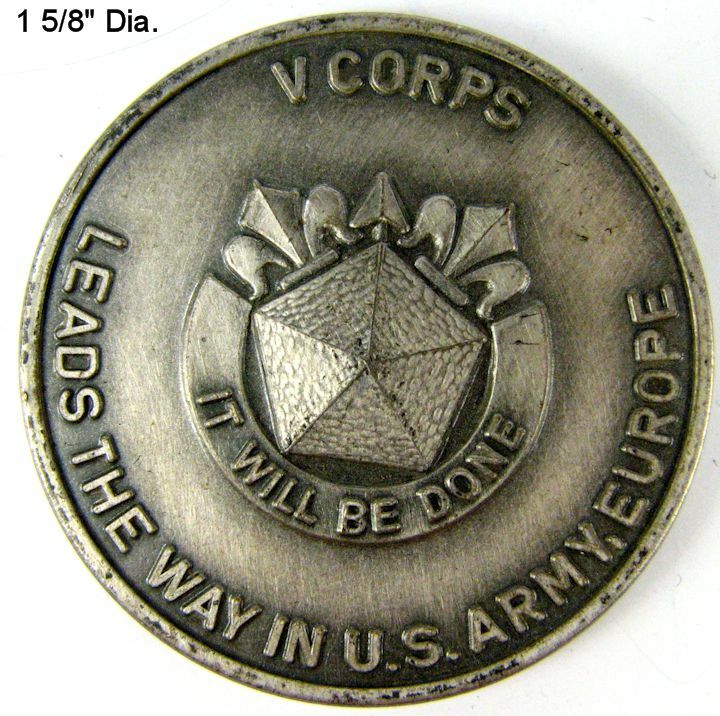 Embossed Signal Corps inignia and the name SIGNAL CORPS on the front. Plastic inserts are old, brittle and yellowed but can be replaced with new one if disired. On the back is "WARRANTED 14KT. 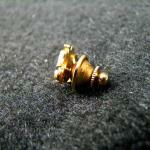 GOLD PLATED on GENUINE BRONZE". Measures 1 3/4" X 1 3/8" in size. 1953 DOG TAGS, 5th ARMORED BOOK and 1950's MPC: 1953 items belonging to Norman E. Johnson. His dog tags with a T53 date. 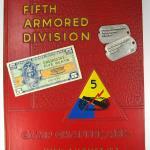 The 5th Armored book from Fort Chaffee, Arkansas dated 1953 and a 5 cent Military Payment Cerificate (MPC) from the 1950's. Johnson is pictured in the book with the 34th Medium Tank Battalion, Company A. All items are used with the book having some minor spine wear and corner bumps. WW2 RING, AMICO. 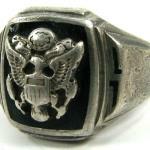 ARMY OFFICER, STERLING: Pretty nice condition ring with some wear from being worn. Marked STERLING and weighs 17.2 grams. Maker mark of AMICO. Smaller size, should fit a finger about 2 1/2" circumference measured at the knuckle. 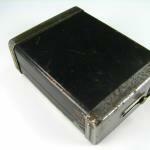 CIGARETTE CASE: Black painted metal case for a pack of cigarettes. "Rogers SLYDE-LOK" on the bottom. Paint wear. 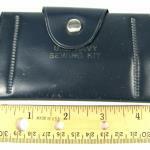 U.S. NAVY SEWING KIT: Blue plastic with needles, scissors and a pack of buttons. U.S.N. 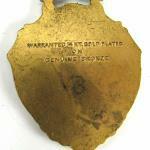 DOG TAGS: I believe these to date late 1950's to early Vietnam War, pre-1965. Service number was NOT his Social Security number. They are on a wire 'chain'. I believe the wire was originally coated with plastic but is now bare wire. The wire has set in the shape shown and is not very flexible. 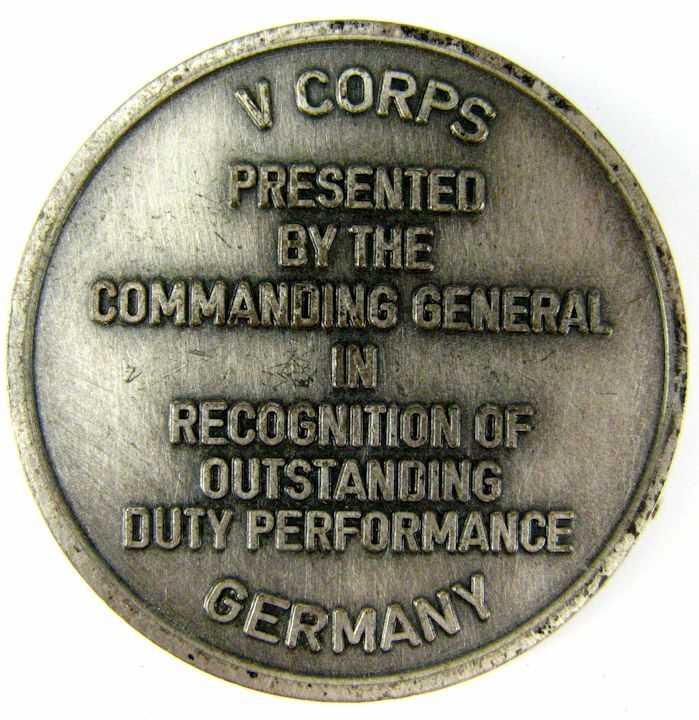 GERMANY COMMANDING GENERAL CHALLENGE COIN: "V CORPS" coin. Type II. 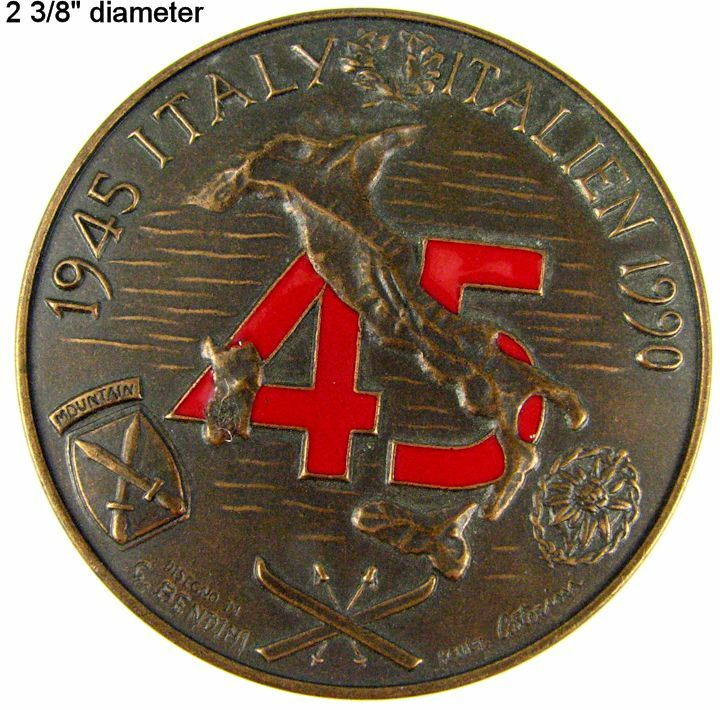 10th MOUNTAIN DIVISION COIN: 45th Anniversary (1945-1990). Large size, red enameled. WWII JEWISH PILOT FLIGHT LOG: He enlisted 17 MAR 1942 and began his flight training June 3, 1942. His photo is taped to the inside cover of the logbook. The last entry in the logbook is January 30, 1944. The entries are from several fields in Texas. He had 1268 hours flight time during that period. I do not know what happened to him after that date. He is listed in the NARA Enlisted Records. Included is his obituary showing him passing away June 12, 1989. He was born March 27, 1917. He had two years of college when enlisting. More research is needed. WW2, MANILA 1945 RING: Hand made and hand engraved. Band is broken and roundness is distorted. Neat souvenir brought home from Manila, PI. It has the shape of a heart so probably purchased for his wife or girlfriend. Not marked, but I suspect it is silver or made from a coin. VIETNAM WAR TACTICAL AIR COMMAND (TAC) ZIPPO, CODE DATE 1967: Cool Zippo lighter from the Vietnam War. It has the Tactical Air Command crest on the front. Carried and well used by an USAF Airman. It has lots of finish wear with scratches and bumps from hard use. The major bump is a dent in the top of the lid where the lighter was dropped. It has no spark so probably needs a flint. I do not know if it works. In the photos you can see reflection of my camera lense. 1945. No next of Kin with the last name first. Found in NARA enlistment records. FATHER (WW1) and SON (WW2) DOG TAG SETS: Neat find. Father enlisted 7/5/1918 and was promoted to Sgt. 12/1919. Son enlisted 8/2/1943 and was assigned to the "Philippine Scouts". The son's tags are the type with no next of kin on them with the first name first. Type tag issued between July 1943 and March 1944. T44 dated. AVIATOR SUNGLASSES: I don't think these are military issue but probably private purchase. There is no name on them that I can find. They are in nice condition for display. There is a screw with a nut installed at one side. The other side's ear wire has the 90 degree stop worn off and it will open past the usual position for wearing. That really doesn't effect they way they display. Cool looking shades. The hat of course is not part of this sale; just to show how the glasses will display. U.S. ARMY TRAVEL CHECKERS GAME: Folds up to a 4-3/4" square. Opens to a 9-1/2" square game board. Checkers are in two drawers that slide out. 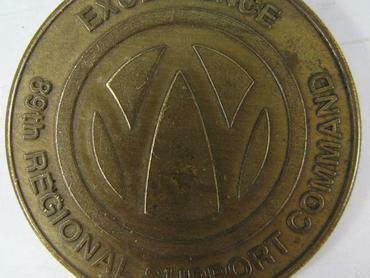 Light scuff mark on front below and left of insignia. 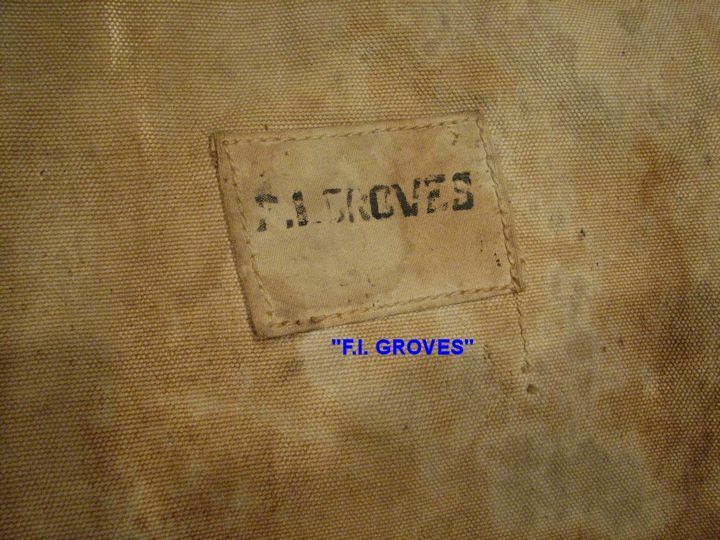 This is a white Navy seabag that is identified with the names of two brothers who served in WW2. 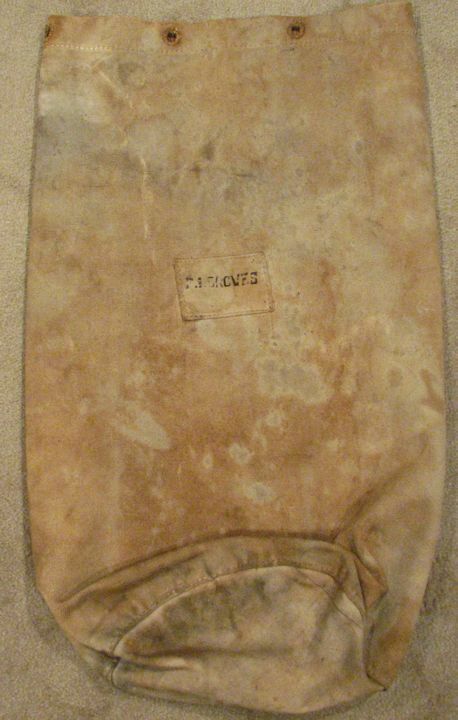 Best I can tell from research is there were four brothers who served in WW2 and this seabag was used by two of them. I do not know if they were on the same ship or the bag was passed from one brother to the other. Clyde V. Engholm retired from the U.S. Navy and the U.S. Air Force so when he went to the Air Force he MAY have passed this bag on to his brother, Charles Eugene Engholm. I have copies of two of the Engholm obituaries that lists all four brothers, Clyde, Charles, Floyd and Ernest Jr. Interesting seabag worthy of further research. The bag is fairly clean with staining which mostly is on the bottom. The original draw string is included. The bag has metal grommets. 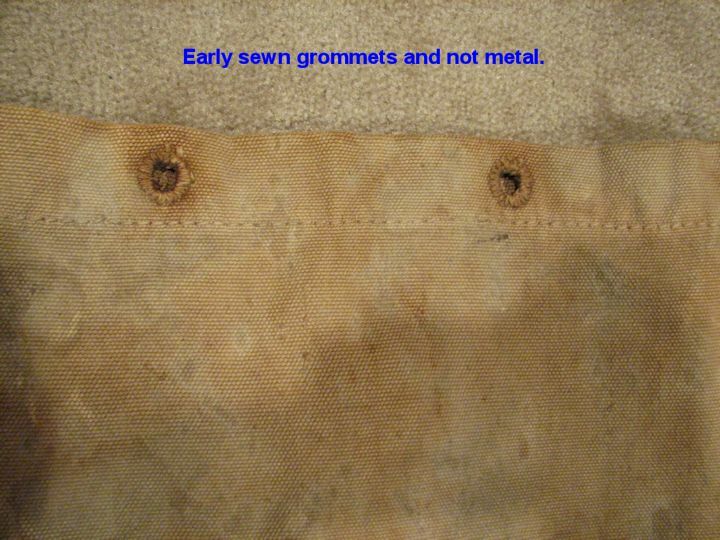 EARLY U.S. NAVY SEABAG: I believe this Navy seabag to be early due to the grommets being sewn instead of metal. I do not know if was originally white and has stained to the brown color or if it was a brown shade to begin with. It does have lots of staining. It is ID'd to F.I. GROVES. I have no information on him, but the bag came out of Illinois so research may find him. BOATSWAIN MATE BOS'N PIPE LANYARD: Lanyard only, no pipe with this one. Made by a U.S. Navy Boatswain Mate. ZIPPO BELT BUCKLE, VQ-2, FAIRCONRON TWO: Nice belt and buckle. 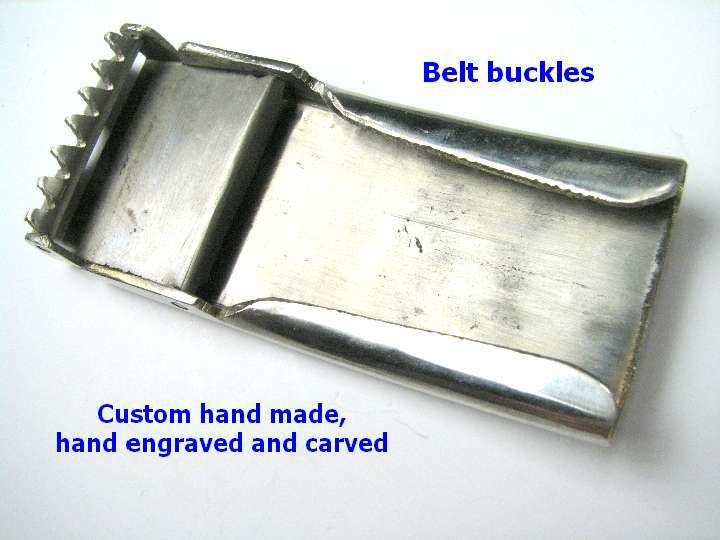 Buckle made by Zippo with VQ-2 insignia. Belt is a large, over 50" long. Belonged to a U.S. NAVY pilot by the name of WERNER who flew Douglas Skywarrior aircraft, EA-3 (A3D). 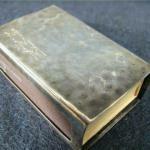 SOLDIER'S FABLED "LITTLE BLACK BOOK": They are all by the same maker and none have been used. I only have the brown one left. GOOD LUCK TOKEN DOG TAG: Pvt. Hughes enlisted Dec. 4, 1945 (NARA printout included). 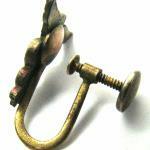 He used a Good Luck token like found at Carnivals and he punched on it his name, rank, service number and State. In the center he put a hole to carry this Good Luck Charm. The side with his name etc on it has a 4 leaf clover and "Good Luck" in the center. The back side, in the center, has the American Flag. ST. RITA POCKET SHRINE: Commonly carried in the pockets of soldiers. 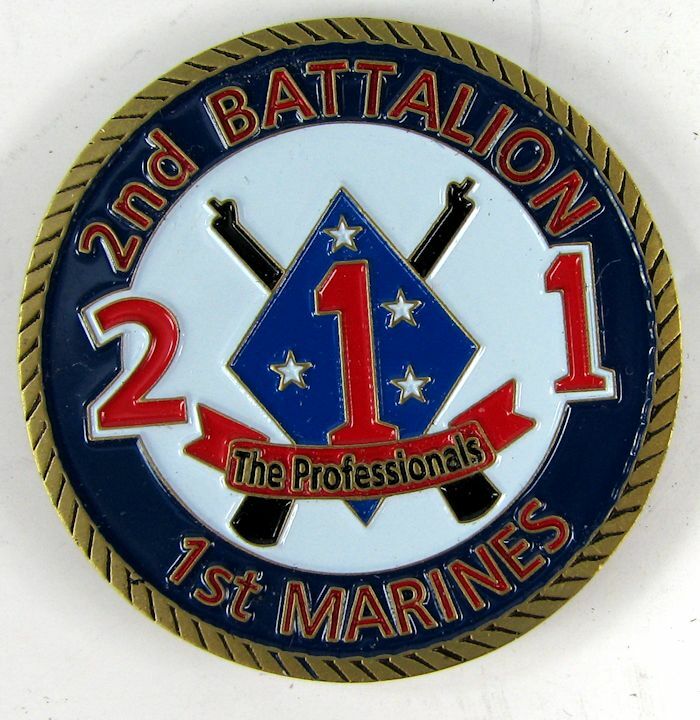 8th ARMY CHALLENGE COIN: 1-1/2". Pretty colors. Engraved: "CG EUSA". Korean War period. 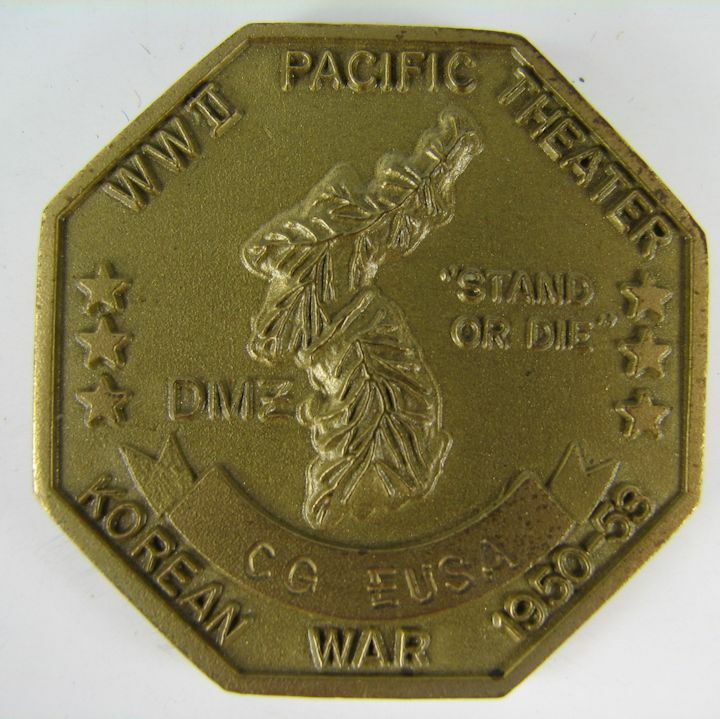 557th MP COMPANY: Korean War period Challenge Coin. 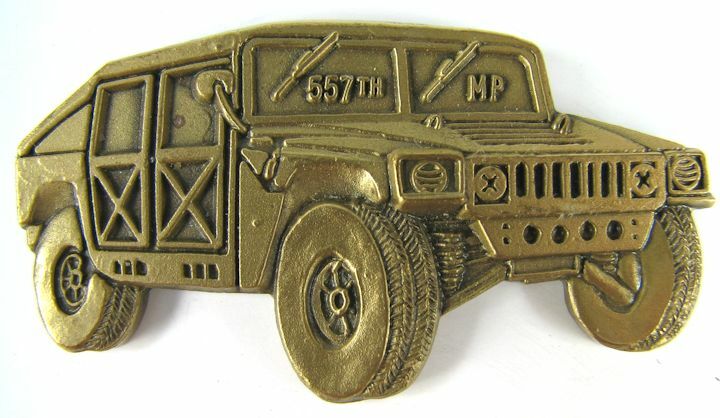 "GUNS OF AREA III, 557TH MP CO.". 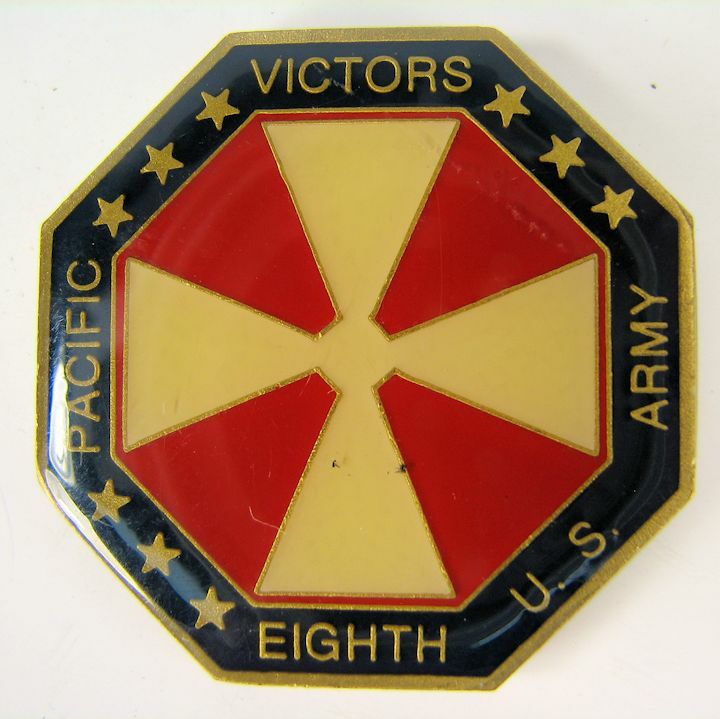 Enameled insignia on the back. 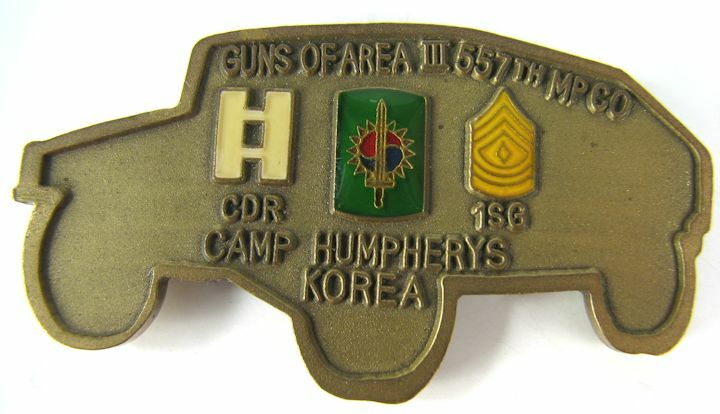 From Camp Humpherys, Korea. VIETNAM WAR ZIPPO: Smaller sized lighter. The top lid has been replaced and it is not as worn as the body, but looks OK. It fits fairly well and closes fine, but there is no spring snap closed. Engraved on on side VIET NAM 70-71 and on the other side are the soldiers initials GAV. Has no fluid or flint in it. ZIPPO CIGARETTE LIGHTER, VIETNAM, QUANG TRI. 1968-1969: Neat personalized lighter owned by "Bill". Served at Quang Tri, Vietnam 1968-1969. Zippo is base code dated 1968. Untested, needs flint and fluid to check. Used. Lid is a tight close. 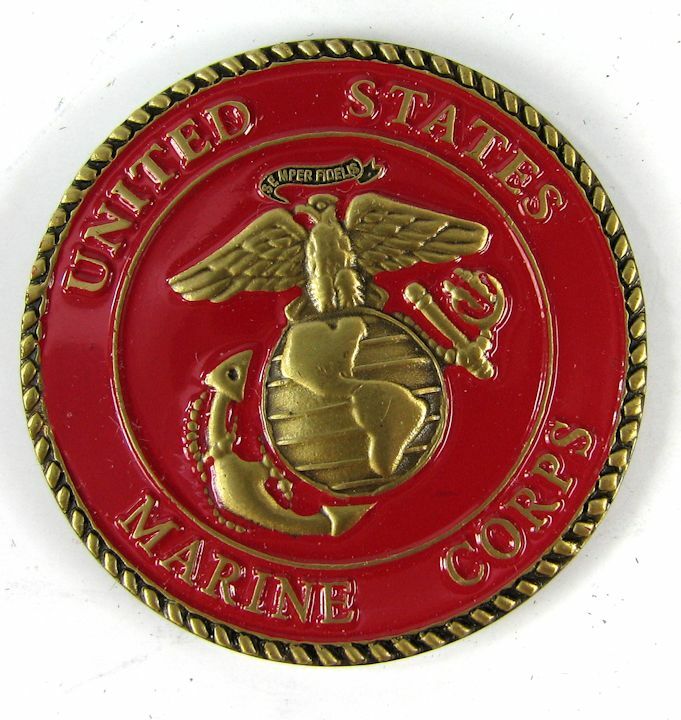 USMC RING: Features the EGA set in a colored mount with "UNITED STATES MARINES" around that. On one side is "TUN TAVERN 1775" and on the other side is "IWO JIMA 1945". Size is unknown but the inside circumference is about 2 1/2". Composition is unknown and it is unmarked. It has had use and wear evidenced by the dings in the edges of the band and the wear to the plating on the inside surface. UNUSUAL SET OF DOG TAGS WITH LUTHERAN MEDALLION: First off I believe the number was the man's Social Security number so I have blocked it from view. Second, there are two types of tags; one is notched and the other isn't. 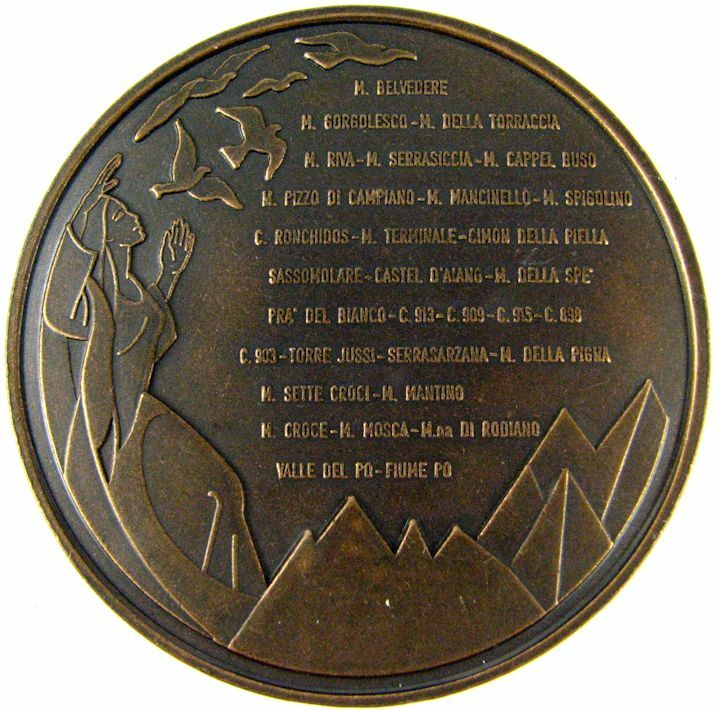 Third is a nice Lutheran medallion to notify Chaplan etc. Nice set, probably Vietnam War period. WW2, "PARK", GREEN LIGHTER: Nice PARK lighter in Green. Initials scratched on the front. It has flint and only needs fluid to work. First green one I have found, usually they are black. No problems with this nice WW2 lighter. U.S. ARMY ISSUE HANKY, HANDKERCHIEF: 17" X 16". OD green color. No problems. 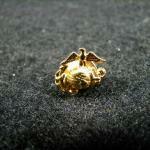 USMC TIE CLASP: No problems, works as it should. LAUNDRY BAG, ID'd: I will call this small bag, 18" X 24", a laundry bag. 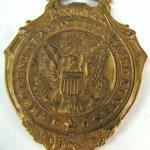 It belonged to a 20 year Officer who was a Vietnam Veteran as a Captain and retiied as a Lt. Col. I include a copy of his grave marker from Jefferson Barracks, Missouri. There are two spots on one side. USS AMERICA, CVA-66. 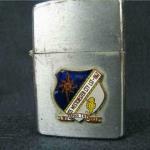 VIETNAM WAR PERIOD LIGHTER: Zippo code dates this lighter to 1966, Vietnam War period. 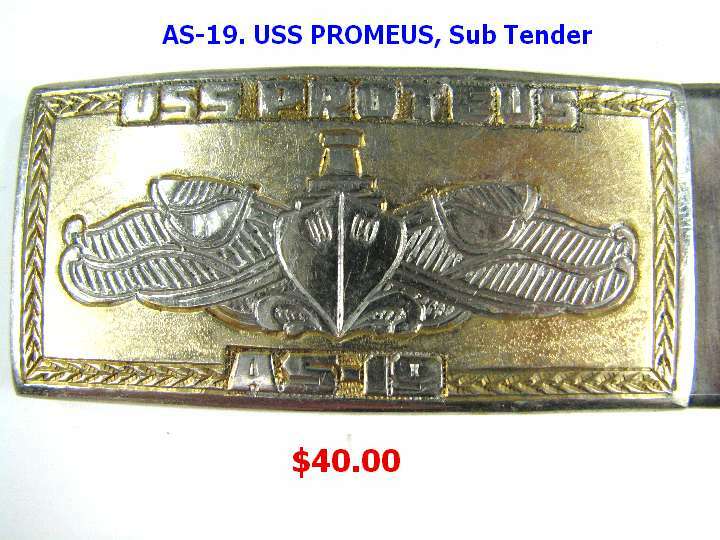 It has the aircraft carrier USS America crest on the front: "UNITED STATES SHIP AMERICA, DON'T TREAD ON ME". Will need flint and fluid to operate. Several shallow dents that I tried to show in the photos. Good hinge. This small lighter appears to be unused. 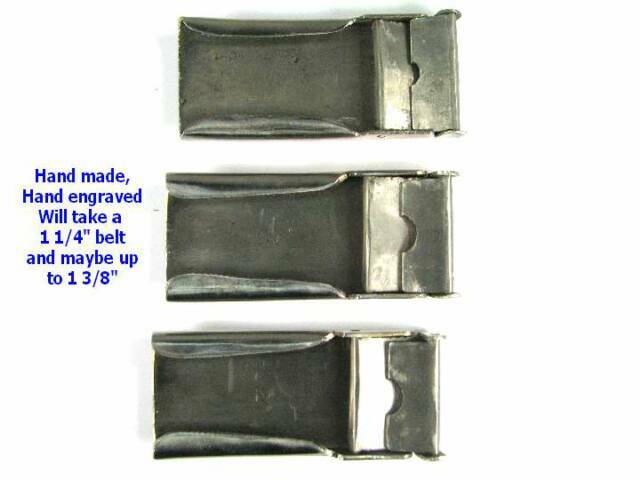 It is 1-3/8" high and 7/8" wide. 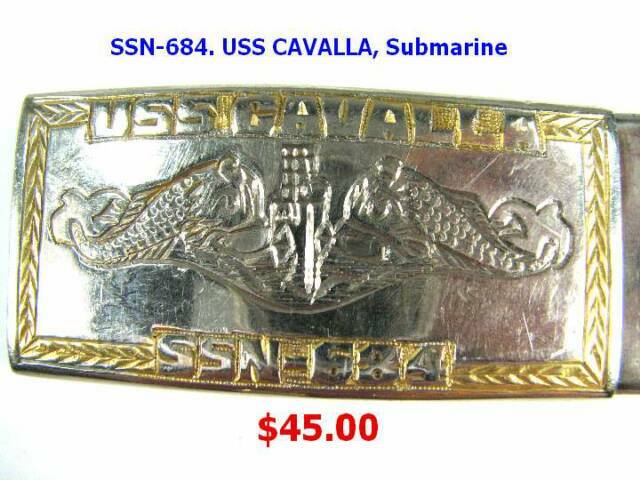 On the front is "USS CORAL SEA CVA 43" and "SOUTH VIET NAM 1966". On the bottom is the logo of HILBORN-HAMBURGER with "JAPAN". Neat momento. LIGHTER, 1948 VFW NATIONAL ENCAMPMENT, ST. LOUIS: Ivory colored plastic lighter with a lift off top. VFW logo, National Encampment, St. Louis 1948. Measures 2-1/8" high and 1-1/8" wide and 1/2" thick. Neat VFW item. 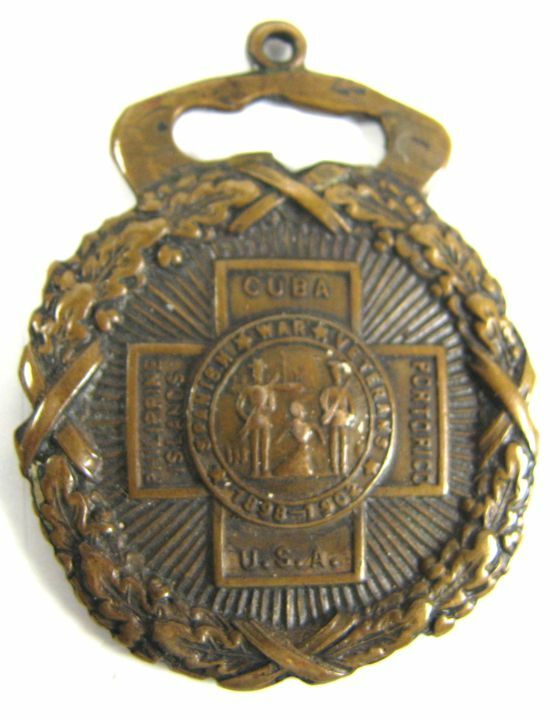 SPANISH AMERICAN WAR VETERAN'S WATCH FOB: Nice item from the turn of the 20th Century. Very patriotic time in our history with Teddy Roosevelt and the Rough Riders in Cuba; Admiral Dewey in Manila and Remember the Maine. Nice fob about 1-3/8" wide. 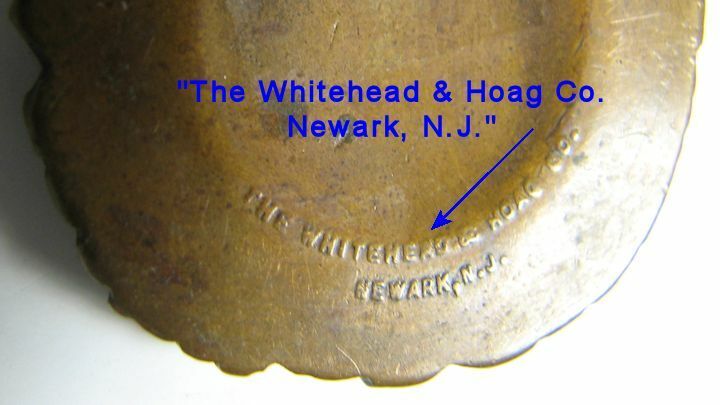 Whitehead and Hoag maker mark. Nice patina, never cleaned. 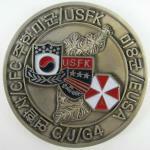 KOREAN WAR, US NAVY DOG TAG: Joseph Raymond Parisi. Copy of his gravemarker included. Rating was a "Teleman" which was only in existance between 1948 and 1962. Single tag. 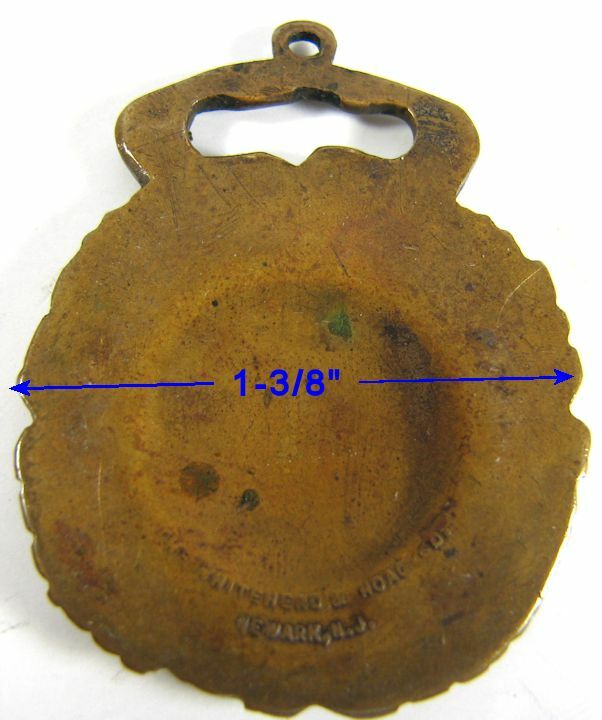 I don't know the dates but, this has to be near the end of use for this shape/style of dog tag. KOREA SOUVENIR RING, 1953: Brass ring shaped like a heart. KOREA is carved across the top. 1953 is carved on one side. On the opposite side is carved either IJN, JN, or UN. Good condition. "BAGS, BARRACK, OD". PHILADELPHIA QUARTERMASTER DEPOT: Measures about 22" X 31". Rope drawstring. No name, just the contract stencil inside the bag. It has no problems except minor soiling. 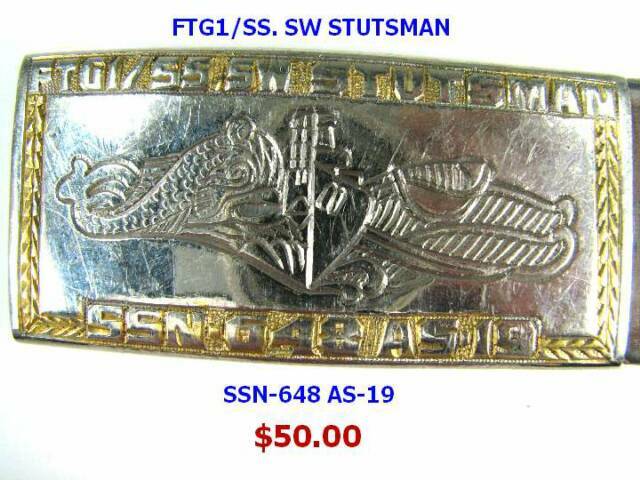 BELT BUCKLE: As seen in the photos. Needs to be cleaned and polished. U.S.S. MOALE served from 1944 to 1973. 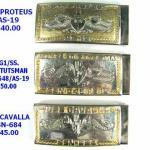 BELT BUCKLE: As shown in the photos. Needs cleaned and polished. Pant's belt comes with it. The U.S.S. PETERSON served 1977 to 2002. AIRBORNE BELT BUCKLE: Standard solid brass web waist belt buckle with a silver (?) tone Jump Wings applied. Neat item. 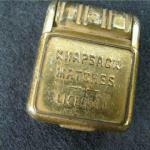 TRENCH ART CIGARETTE LIGHTER: Appears to be made from the jackets of .50 caliber cartridges. There is no flint or fluid in it. When closed it makes a nice shaped item for carrying in the pocket. There are some dents in it. Original patina, never cleaned. 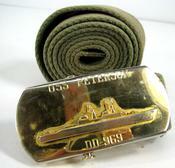 SAILOR'S MONEY CLIP: Neat old money clip with a fouled anchor on it. Never cleaned. See the photos for the size. SASEBO, JAPAN, PO1 & PO2 OPEN MESS. LIGHTER: Made by Penguin, Japan. 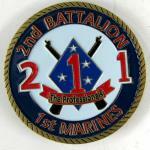 Has emblem for the "1st/2nd CLASS PETTY OFFICER'S MESS OPEN", "SASEBO, JAPAN". Lid doesn't close tight; some finish loss on the edge as shown in the photos. No flint or fluid. 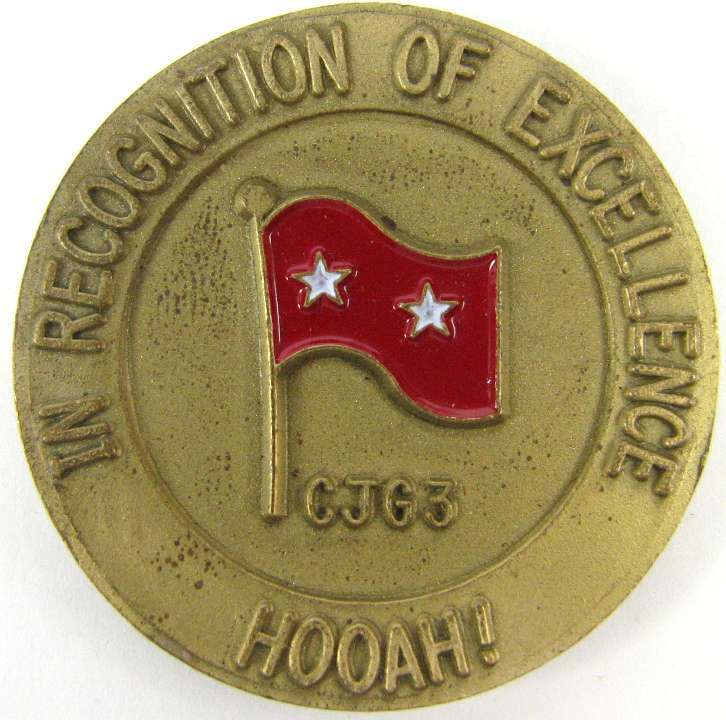 89th DIVISION CHALLENGE COIN: Marked "EXCELLENCE"; "89th REGIONAL SUPPORT COMMAND" with the 89th's logo in the center. About 1-1/2" diameter. Copper or brass material. Looks like a bust of Paul Revere on the front. AUDIO LETTERS, KOREAN WAR DATED 1951: Sent home to Missouri from San Diego by U.S. Navy sailor, an Internal Communications Specialist, First Class; Arthur R. Faupel (IC1). He passed in 1997 and is buried in Jefferson Barracks National Cemetery (Copy of his headstone included). There are two 6-1/2" records in the original mailing envelope. One of them has hand written titles on both sides and the other record does not. Since the one has no titles it may have not been used. I did not attempt to play these. They have some heavy cracking from time and age and most likely will not play without problems. "Wilcox-Gay, Recordio Disc". METAL SOAP DISH: No markings. Well used with lots of dents, pits and finish wear. Nice for footlocker display.